Placed a PICC line in left brachial vein.Â Pt. felt a shooting painÂ down left forearm into 1st finger and thumb.Â I was placing a 4fr solo power picc by mst and ultrasound.Â Pain occured twice with needle removal and insertion of microintroducer.Â PainÂ wasÂ ver brief and subsided quickly.Â No pain when procedure done. Would you stop PICC placement procedure with any pain like this? Yes, would stop immediately. If any nerve damage occured and the PICC was left in place there would definitely be liability issues. Also for ongoing assessment it would be hard to differentiate potential problems, nerve damage vs phlebitis if the pt. were to complain of pian. When ever a patient c/o nerve pain (shooting pain, electrical shock, tingling sensation etc) you shoud "ditch" that site and either go higher up, or choose another vein. 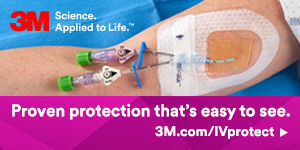 Going on with the insertion and leaving the catheter in only invites problems that may lead to permanent nerve damage. when a pt c/o nerve pain take a good look at your ultrasound image, some times the nerve images ad a tiny bright spot usually right between the Brachial artery and brachial vein. When pt complains of nerve sensation withdraw the needle immediatly and try to teach yourself how the nerve images on the ultrasound since you know exactly where that needle path was, it will allow you to avoid nerves in the future. I too would remove the catheteer and select a different site. I have had this nerve hit during a routine blood draw and it was extremely painful, I can't imagine the discomfort of leaving the line in place. We have to be very careful when placing these lines so as not to cause nerve damage. Even if we do not encounter any problems during insertion, I always tell my patients that if at any time during the catheter dwell time, they have shooting pain down their arms or a constant tingling sensation into their fingers, we should consider removing the catheter. As stated in one of the other responses, you can usually see the nerve bundle on your ultrasound (the sonosite shows it great - it looks like a piece of honeycomb cereal) and they are usually located near the brachial veins, but are found sometimes near the basilic.